haha, Now I have your attention? I notice in 99% of videos posted of youth hitters, the kids have their back elbow down (and/or the back forearm is not horizontal) at toe touch. This is simply fundamentally flawed. There is no way to recover from this flaw (unless you are Paul Molitor). A kid can't turn the bat head back toward the catcher with optimal power if his elbow is already down, or the back forearm is vertical. Further, most youth 'bat drag' is caused by having your elbow 'down' (back forearm is more vertical than horizontal) at toe touch. There is nowhere for the back elbow to go, but to push in front of the hands. And that is the definition of bat drag - the back elbow gets ahead of the hands. Also, I don't believe most kids are practicing the coil/stride move. This should be the first thing you learn in hitting. Why waste time and money buying cage time, and $400 bats, and thousands of $$$ for a travel team (Dads, you know who you are), when you don't learn this simple thing at home for nothing? Have him stride to toe touch (without a ball), and as he strides forward ... stretching his front arm back (bicep pressing the torso), take his hands to a point near his shoulder (see Note 1 below), his back elbow should be 'up' (roughly even with his shoulders, with the forearm horizontal) at toe touch. In the stance, his back elbow does not have to be up. Some people tell kids to imagine pulling their hands back like they are pulling a bow string. That's a good way to think of it. Note 1 - If your hands start forward, they will go 'back' to the shoulder. If they start up, they will go 'down' to the shoulder, etc. At toe touch the hands should generally be near enough to the shoulder that you can touch the shoulder by extending the thumb of the top hand. Make sure you stride far enough to extend the back leg just before toe touch. In the stance, it makes little difference where the elbow or hands are. Also, in the stance, ignore the 'door knocking knuckle' cue myth, use a box grip with a loose top hand. These are definitions of 'up' and 'down' for the purposes of this in the 'back elbow up vs. back elbow down' debate. UP - anything within 30-40 degrees or so of this is 'up'. This picture is the typical MLB back elbow position at toe touch (although this back forearm could be slightly more horizontal). Notice the hands are (correctly) in front of the back elbow. DOWN - anything within 30-40 degrees or so of this is 'down'. This picture is the typical LL and guru instructor elbow position at toe touch. No current MLB hitter does this. Notice the hands are (incorrectly) behind the back elbow. Add to the stride drill above, exaggerate coiling inward both shoulders and both hips 30-40 degrees, as you stride forward. You will uncoil immediately before you land, but there's no need to 'drill' that, it happens anyway. Posey coiling inward as he strides forward. Notice the back elbow does not go/coil behind the shoulder line during the coil in (scap doesn't 'load' until instant of coil out). 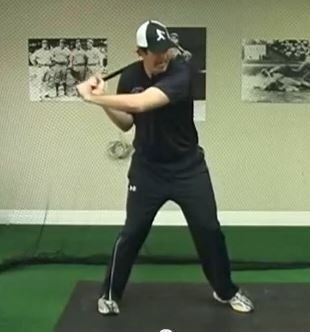 If you can turn the hips and not slot the elbow, then you are spinning the hips and shoulders together - as you uncoil, and the turn of the hands is the only option remaining to turn the barrel. The initial uncoil movement is what is the very beginning of turning the barrel, pinching the scap, and dropping/driving the elbow down to the hip. Notice the hips uncoil first, but the shoulder does not for a frame or two. Notice the hands/elbow are still going back sorta toward the catcher. Last edited by songtitle; 01-15-2019, 06:18 AM. I thought for sure this "secret drill" was going to involve a towel...? ...his back elbow should be 'up' (roughly even with his shoulders). I'll add more than Molitor. 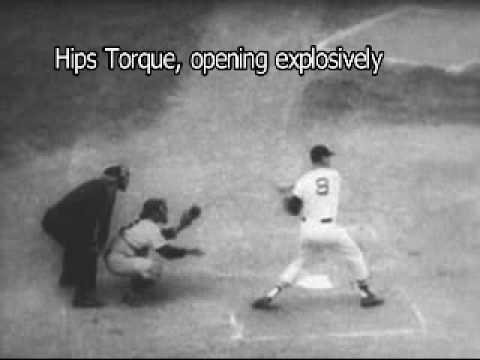 Ted Williams' elbow never got close to what you are discussing. Neither did Dimaggio's. It's hard to argue with .406 and 56. Jeff Kent didn't get roughly even with his shoulders. There are current MLBers who don't come close to this. Kinsler gets about 1/2 way there, maybe a touch more. I notice in 99% of videos posted of youth hitters, the kids have their back elbow down at toe touch. A kid can't turn the bat head back toward the catcher if his elbow is already down. Why waste time and money buying cage time, and $400 bats, when you don't learn this simple thing at home for nothing? Have him stride to toe touch (without a ball), while... stretching his front arm back, take his hands back/up/down to his shoulder (should be able to stick out his top thumb), his back elbow should be 'up' (roughly even with his shoulders). Other than ignoring the 'door knocking knuckle' myth, it makes little difference where the elbow or hands are in the stance. 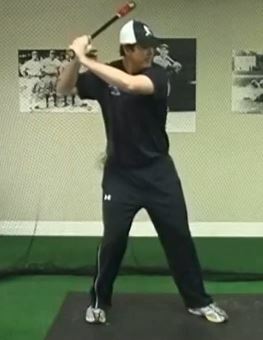 Serious question from a dad/coach: if 99% of youth hitters do this, is it really as bad a problem as advertised? I realize most MLBers don't do this. Perhaps youth generally just aren't capable? or it should be something to strive for as they develop? I ask because my 10yo has his elbow down at stance and toe touch (never gets his elbow up) and he also has bat drag. He also consistently hits the ball hard to all fields, has a very good BA playing against older players and has a lot of power. He also happens to be very big and strong for his age and has excellent hand eye coordination. I used to work with his hitting mechanics more when he was younger, usually with poor results. Sometimes it was things I had read in hitting books that I wasn't even sure I believed. I've learned a lot more about the swing since then and realize some of it wasn't good advice. He would look at me funny but try what I was saying. Since then, I've consciously backed off on messing with his swing mechanics and let his natural athleticism and aggression take over. Instead, I've thrown him lots of BP and only occasionally make minor tweaks to his swing when there's something obvious. The results have been very good. (even though I wouldn't say he has an MLB type swing). Long rambling I guess to ask: do you mess with your kid's swing that is getting good results, even if you think it's not following optimal swing pattern/mechanics? I've worked a lot on this with my son over the summer, and, while he sometimes chicken wings it instead, he has gotten much more consistent getting his back elbow up at toe-touch. Now whether or not it's necessary is beside the point because the main intent behind doing it was that the next time I post a video of his swing, Song will have to think of something different to say! haha, Now I have your attention? I notice... kids have their back elbow down at toe touch. Your kid must be a freak Uncoach! All kidding aside, I will side with Song on this one if you want early bat speed that can hit the cheese MLBers throw....keep your elbow up at toe touch. Nobody said it had to be way up....just not down if you want to hit with power in the big leagues. It also helps keep the hands back for good separation between core turn and hands/bat lag. So Ted Williams had no power? "his back elbow should be 'up' (roughly even with his shoulders)." That's way up, imo. Last edited by The Uncoach; 08-30-2013, 02:13 PM. Good post (coming from another dad/psdeo-coach). I really believe there are age appropriate expectations for hitters as they grow up. But it's very very hard for people on the forum to define, from my experience. It's not exactly as Song describes, but I'd say your son does what Song is talking about. As he loads, the elbow goes up. At toe touch, he's elbow is up at it's peak (not to the shoulder height, but definitely up and off his rib cage). For me, if Song saw this, I doubt he'd say "back elbow is down at toe touch." My take is your son would pass the Song test. Look forward to hearing Song's thoughts. well the elbow certainly doesn't need to be shoulder high, but I do think that it is an advantage to have the upper arm away from the body. williams doesn't really have the elbow up, but at least about half way up (elbow away from the body). While I think that song is overblowing that topic I do think that the elbow lowering can leverage the barrel turning somewhat and thus avoid having too much of a "pull" or draggy swing. I would however not view that as an easy fix for everything cue, there are definitely more important things to do in the swing. Songtitle stated in the OP. "roughly even with his shoulders." That means that I should essentially be able to draw a straight line from the front shoulder through the back elbow at toe touch. That's demonstrably not an absolute in good hitting. "Off the ribcage" may be a better phrasing, which you have stated.